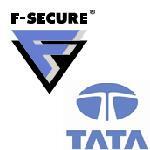 Tata Communications has entered into a partnersip with F-Secure to offer mobile phone security services. With this partnership, Tata Communications will be the first to offer F-Secure’s award winning complete Mobile Security package, which includes virus protection, malware protection and an integrated firewall, to over 50 million smart phone users in India. Mobile Security allows smartphone users to experience the full potential of their handheld devices without the fear of mobile threats. The application can be downloaded directly to GPRS-activated smartphones fromhttp://mybusiness.tataindicombroadband.com/MobileSecurity.aspx or http://in2biz.in/MobileSecurity.aspx. The suite supports all main mobile operating system platforms like Windows Mobile, Symbian and UIQ, and delivers real-time, invisible and automated safety with easy to use firewall rule sets and automatic over-the-air antivirus update. The firewall provides additional security for all mobile devices that access public networks like Wi-Fi. Mobile Security protects the mobile from spyware and espionage software that may monitor and record all the actions on a mobile phone, including voice calls, SMS, multimedia and e-mail messages. It safeguards phones from unwanted billing (caused by viruses that are trying to propagate/infiltrate) and additionally protects the handheld device from becoming unusable due to malware.